Dark roast coffee with my bike and the L Street cycletrack in the background. Coffeeneuring has returned! The rules are simple – bike to seven different coffee shops by November 16. Check out Chasing Mailboxes for all the details of this coffee-fueled, bike adventure. For my first coffeeneuring trip, I took my Specialized Sirrus to the Peet’s at 17th and L NW in Washington, DC. 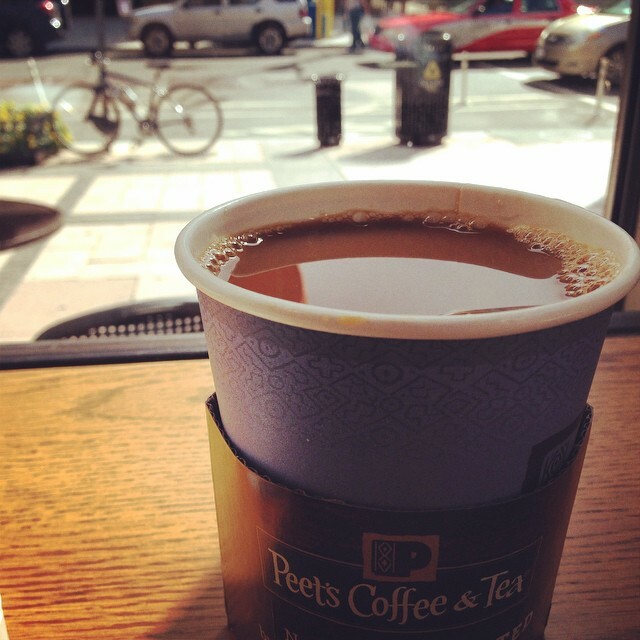 Peet’s is a coffee chain from Berkeley that recently replaced all the Caribou Coffees in DC. I’m a firm believer in feng shui. Some places have good chi energy. With its big windows and corner location, this spot has the plentiful light and ample people-watching that’s perfect for reading, writing or blogging. In fact, I wrote part of my novel Murder in Ocean Hall here when it was a Caribou. Peet’s is an improvement. The coffee is better and the baked goods are delicious, especially the amaretto brownie. Located on the L Street cycletrack, and with the White House just a couple blocks away, the Peet’s at 17th and L makes an ideal coffeeneuring destination. It’s also close to National Geographic and innumerable bikeshare stations. Need more ideas where to go in DC? Check out my seven coffeeneuring trips from last year. Good luck! 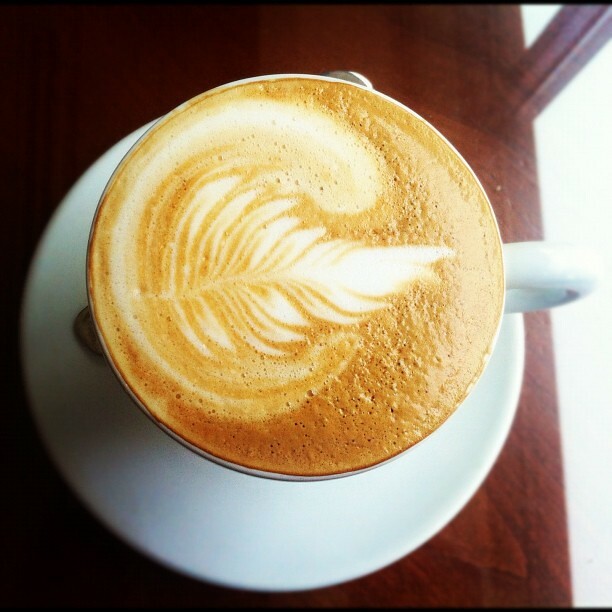 Author Joe FloodPosted on October 8, 2014 Categories ravesTags bikedc, biking, coffee, coffeeneuring, DC, murderinoceanhall, Writing1 Comment on Coffeeneuring #1: Peet’s! Fueled by caffeine, surrounded by low chatter and the hum of background music, I am at my most productive. Something about being in a coffee shop just makes me want to get to work. I wrote my first novel, Murder in Ocean Hall, in a couple of downtown DC coffee shops. I prefer Caribou Coffee, particularly stores that are populated by freelancers and grad students. Being around the studious makes me feel like I better get writing. Check out my guest post – How to Be Productive? Get Thee to a Coffee Shop – on Digital Book Today. It’s about the link between coffee shops and getting things done. I advocate writing in coffee shops. Not only is everything better with coffee, but the combination of caffeine and background noise is ideal for concentrating on your work. I wrote Murder in Ocean Hall in a coffee shop. I reported every morning, as if I was going to work, and sat there writing away from 8-12, telling myself that I was not allowed to leave until my time was up. I aimed for 2000 words a day but most of the time wrote 1100 or so. But the important thing was to be there, to be present, and to keep going. The article goes on to profile Coffitivity, a web site that provides the sounds of a busy coffee house anywhere. But it’s not just sound that makes coffee shops productive places. When I would report to Caribou (and I thought of it that way – reporting to work), seeing all those people all typing away on laptops made me think that I better get to work. Call it peer pressure or socialization. Seeing others work made me think that I better get to work. I better start working on that novel. And don’t underestimate the power of caffeine. It’s not alcohol that makes writers – it’s coffee, with the cheery, well-focused buzz it gives you. Coffee houses have given birth to sprawling novels, symphonies and Western Civilization. Not bad for a simple bean. Pick a store populated with grad students or freelancers – you want lots of people sitting alone at tables, with a minimum of talking. Slow or no wifi is a good thing, because you’re supposed to be writing. Put yourself on a schedule and commit to it. Reward yourself with as much coffee as you want. Habit is a powerful thing. If you spend one hour a day writing, imagine how much you could accomplish in a year. Plus, you get to drink coffee. Writing and drinking coffee – is there any better way to spend your time? I’ve cut the price on my novel Murder in Ocean Hall to just 99 cents on Kindle! This murder-mystery is set in DC, but in the real city beyond the monuments. It makes a perfect gift for anyone who wants to learn more about how Washington works – or doesn’t. Murder in Ocean Hall has received a slew of five-star reviews on Amazon. It is a quick, entertaining who-dunnit filled with memorable characters and a dash of humor. Download Murder in Ocean Hall today! Murder in Ocean Hall – The Perfect Inauguration Gift! Beyond the pomp and ceremony of the Presidential Inauguration, there’s a whole other city, a real city, where people work and live in a world far removed from the ideals and monuments of the Washington you see on TV. It’s a place where ordinary folks struggle to find good schools and survive in a rapidly-changing urban environment. It’s the world of Murder in Ocean Hall. This mystery novel takes place in city neighborhoods like Dupont Circle and U Street. In this book, the world’s most famous oceanographer is murdered. It’s up to a cynical DC detective to solve the case. Along the way, we learn about the history of city and why it works – or doesn’t work. Read this book if you think you’ve been to Washington, DC. The author, Joe Flood, will take you behind the scenes of places you’ve been and tell you how they function then give you insights into people in power and how they fail to function. Think you know Washington? Uncover what the city is really like in Murder in Ocean Hall. Author Joe FloodPosted on January 18, 2013 Categories ravesTags books, DC, kindle, murderinoceanhall, novelsLeave a comment on Murder in Ocean Hall – The Perfect Inauguration Gift! Author Joe FloodPosted on December 11, 2012 Categories ravesTags books, DC, murderinoceanhall, novels, WritingLeave a comment on Murder in Ocean Hall – The Reviews! Murder in Ocean Hall – Free for Black Friday! Murder in Ocean Hall is free for Black Friday! Normally $2.99, I’ve marked the price of the Kindle edition of my first novel down to zero. In this murder mystery, the world’s most famous oceanographer is killed – when a whale falls from the ceiling of the Natural History Museum and crushes him. Suspects are many and it’s up to a cynical detective to solve the case. Murder in Ocean Hall draws upon my knowledge of DC beyond the monuments. Along the way, you’ll learn about the fascinating history of the city and why it works – or doesn’t. It’s a fun, quick read that has received five-star reviews on Amazon. Download it today! Author Joe FloodPosted on November 23, 2012 Categories ravesTags books, free, kindle, murderinoceanhallLeave a comment on Murder in Ocean Hall – Free for Black Friday! Join me on May 12 at 3 PM for an online chat about my novel Murder in Ocean Hall. My mystery about the murder of the world’s most famous ocean explorer is the first book club selection of the Independent Author Index. This new site is a place where “readers meet authors” and is a good example of how communities are forming online to discuss books. Looking forward to answering questions on May 12!